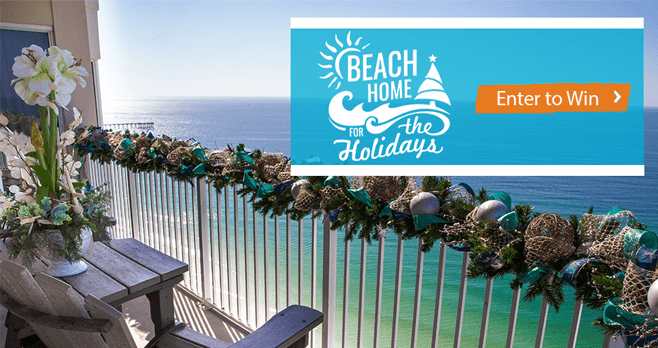 In November, Better Homes & Gardens is offering you the chance to win a Beach Home for the Holidays during the BHG Panama City Holiday Sweepstakes! All this month, participate at bhg.com/PCBsweeps for a chance to be the grand prize winner. You and your family could be sent on a trip to Panama City Beach, Florida during the Holidays! The trip includes a 3-night stay for a family of 4 at the Tidewater Beach Resort in Panama City Beach, Florida as well as a $3,000 in Visa gift cards to be used towards airfare. But wait, there’s more! The winner will also receive a $200 Visa gift card to shop at Pier Park and cash vouchers to be used for meals and attractions. Enter to win today! During the month of November, you are invited to visit www.bhg.com/PCBsweeps in order to enter the BHG Panama City Holiday Sweepstakes. Once on the webpage, you must fill out the online entry form as directed by providing all requested information. Upon submitting the entry form, you will receive one entry into the Sweepstakes. There is no limit to the number of entry you can earn throughout the Sweepstakes Period so you are encourage to participate as many time as you want for more chances to win the grand prize. The BHG Panama City Holiday Sweepstakes is open to legal residents of the 48 contiguous United States and the District of Columbia. Excludes Alaska and Hawaii. Entrants must be 25 years of age or older to enter and win. You may participate during the Sweepstakes Period commencing at 12:01 a.m. CT on November 1, 2016 and ending at 11:59 p.m. CT on November 30, 2016. A random drawing will be conducted on or about December 1, 2016 to select the grand prize winner from among all eligible entries received. The total approximate retail value of trip prize package is $4,755. This Sweepstakes is sponsored by Meredith Corporation, 1716 Locust St., Des Moines, Iowa. For complete details, including Official Rules, visit www.bhg.com/PCBsweeps.